MORE FREEDOM - MORE PRIVACY - DETACHED HOUSE WITH GARDEN. 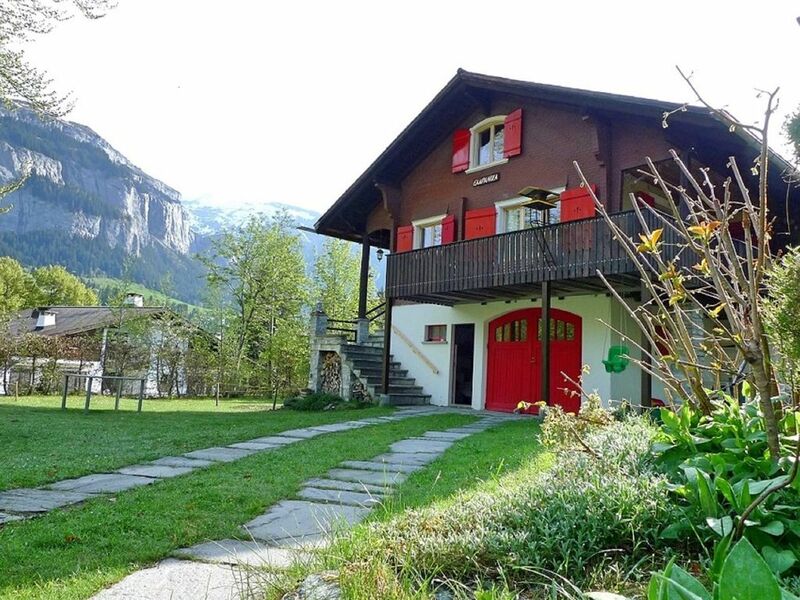 A BEAUTIFUL BÜNDNER CHALET "ALONE-USE". For your upcoming precious holidays CASA CAMPANULA is at your disposal for absolute sole use. Early reservation recommended. EXCLUSIVELY UNIQUE: Your P R I V A T S P E H E R is still guaranteed. Here assure still a very large piece of their own holiday. Enjoy your precious time and custom vacation Reich 100% personal. Ideal the quiet holiday oasis with a now very rare added value: the own secluded holiday garden - undisturbed moments will delight the whole family. Holiday - but correct. GOOD TO KNOW: SPECIAL OFFERS customized for you; erhältl. on demand. > Deep blue sky - sunny-true winter mood. > Take a deep breath in the clean, crystal-clear mountain air. to breathe. It is worth it .. A wonderful pleasure. > Distance. Slow down. Present is now. > Have a personal "good leave"
This absolute special offer is unfortunately not possible in the Fewo computer program. Immediate contact with the owner. My answer >>> my offer - personally to you. Offer valid as long as there are still free weeks available. Benefit! You can expect a Grison chalet with a lot of holiday ambience. Built from the healthy wood from Arven / pine and spruce from the Flims Grosswald. Feeling at home during your holiday is easy at Casa Campanula, which offers an unforgettable feel-good atmosphere in summer and winter alike. A solid building with cachet in massive wood construction. A large balcony; partly covered - also good for dining al fresco. Absolute, bright distant view of the Alps, mountain peaks and the nearby, Crap da Flem - the mighty Flimserstein. Secluded garden 1000m2 with partly mature trees. Playground, deck chairs, barbecue. Firewood for barbecues available at no cost. GOOD TO KNOW: The offer price published here is always a fully-computerized number; a multiplied benchmark in euros. For technical reasons, unfortunately, an individual special offer is never possible on this holiday portal page. Always claim the owner's own customized price quote for you. HERE TO ASK FOR MONEY AND IS FREE. We are happy to answer your questions by e-mail. VERY INTERESTING FOR CHILDREN'S FAMILIES: CAMPANULA BIMBI SERVICE COMPLET: TIMBER CHILDREN'S BED, TRIP TRAP, CHILDREN'S WRAPPING TABLE, POTS, CHILDREN'S BATHTUB, CRAWLING CLOTH WHICH IS ALSO SUITABLE AS TIE-PAD PROTECTION. EVERYTHING AVAILABLE-AT YOUR DISPOSAL. BABYSITTER MEDIATION AT THE TOURISM OFFICE. Opening windows overlooking the countryside. Large bright mirror. From the parents' room additional directly access into the bathroom. Available: bed bottle. Hairdryer. Infants bathtub. Changing table. Peak season rental from 4 - 5 people. , , , , , In the OTHER WEEK rental already from 2 persons. +++++++++++++++++++++++++++++++++++++ ++++++++++++++++++++++++++++++++++++++++++++++++++ ++++++++++++++++++++++++++ The great holiday home for families with children. An ideal holiday home for 2 to 7 people. Also very suitable for the generation which maintains retirement and in the low season want to benefit from the promotional prices. Non smoking with no pets feel at home here. ANTICIPATION Let us inspire you on your own website the Casa Campanula Flims- Waldhaus: www. ferienhausflims. ch PRICE for number of people and season. ASSOCIATED COSTS individually by number Pers. Please contact us for a quote according to our own website. This is one of the few beautiful old style smaller chalets left in Flims. The charm of the house added to our holiday experience: like how a holiday in Switzerland is meant to be. The interior is also in style, simple and functional and had everything we needed, including a tile stove to heat the living room. Beds were good. We were there with 4 guests, which left us with plenty of space as the house has beds for 7 or 8. With one bathroom and a small kitchen I would probably not go there with two families, but for one large family it is perfect. The house is located towards the end of a dead end street, so very quiet. Official footpaths start in a few hundred meters from the house. We went to the ski lifts by car and parked our cars in the new Stenna parking. There is a ski bus stop near the house as well, though. We found the flims- laax- falera ski area is one of the best we have ever visited. Contact with the owners was excellent, very friendly. Unsere grossen Hoffnungen für einen Urlaub mit unseren Kindern im Schnee wurde erfüllt. mit Arvenholz getäferte Stube, mit dem grossen, sehr praktischen Tisch. Wir waren nicht allein, von der warmen Stube aus konnte man die vielen Besuchern des Vogelhaus auf dem Balkon gut beobachten; 14 verschiedene Arten. Bestimmt kommen wir in dieses ideale Haus zurück. Wo gibt so was noch! Ich war mit meiner Familie letztes Jahr 1 Woche in der hübschen Casa Campanula. Es war ein herrlicher Urlaub in Flims. Das Haus bietet sehr viel Umschwung und das haben wir sehr genossen da wir in einer Stadtwohnung wohnen und ständig Rücksicht auf unsere Nachbarn nehmen müssen. Wir fühlten uns mitten in der Natur, frei und glücklich. Das Haus ist zwar nicht mehr neu, dafür bietet es die nötige Portion Romantik und echter Bergnostalgie, die mein Mann und ich sehr geschätzt haben. Die Zimmer sind geräumig, so dass jeder sein Rückzugsort gefunden hat. Das Haus war beim Bezug im tadellosen Zustand, sehr sauber und gut ausgestattet. Ich kann diese Ferienlocation nur weiterempfehlen. Well located in the preferred district of the holiday region of Flims-Laax. The house is located on a private road without transit traffic. Quiet location in Flims Waldhaus - close Caumasee. Direct, easy access to the garage. Lots of sun, songbirds, squirrels. Beautiful forest walks and easy ways to clear, romantic forest lakes start right on the doorstep. Grocery stores, cafes, restaurants, newsstands, banking, tourism information center. A magnificent C U M A S E E drives. Fascinating not only for botanists.